Thieves used a front-end loader early Saturday morning to rip away part of the wall of a St. John's bank. 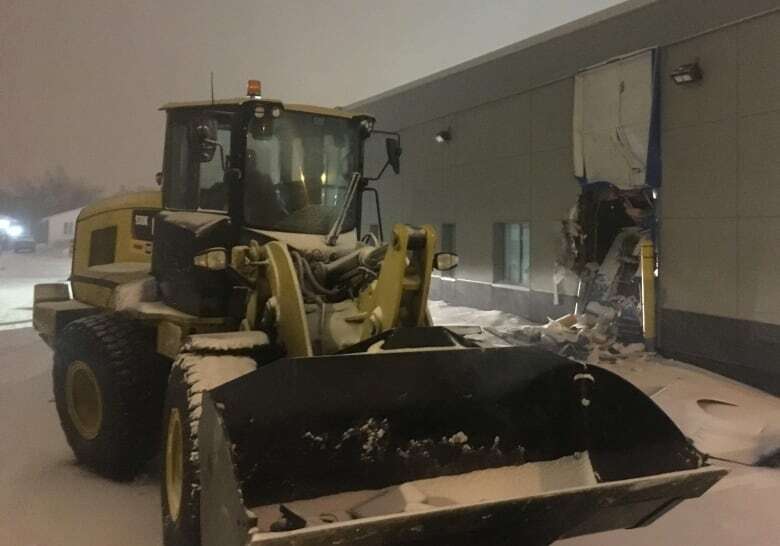 Police have arrested two men in St. John's after a front-end loader tore into a bank early Saturday morning, marking the fourth time in a week that heavy equipment was used to break into a business on the northeast Avalon. BREAKING NEWS - As a result of this mornings attempted theft of an ATM machine we have arrested two males. The investigation is on-going with further details to follow. The machine was ditched outside the BMO branch on Newfoundland Drive, in the city's east end. 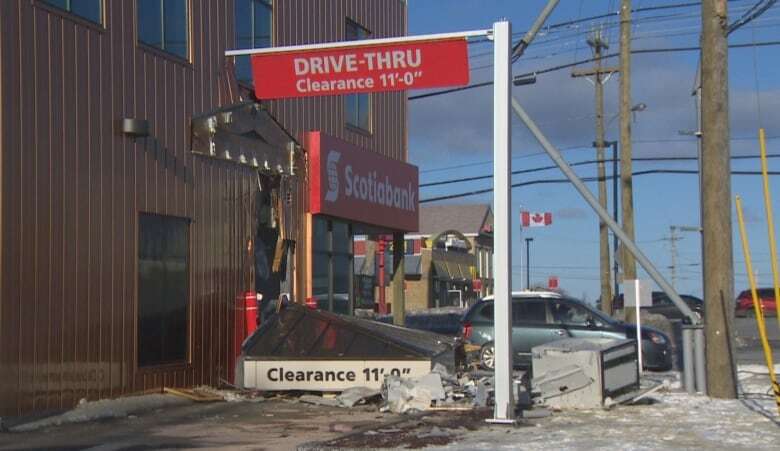 Excavator used to tear into Scotiabank in C.B.S. The loader was used to gain access to an automated teller machine. The robbery triggered an alarm at 4:35 a.m. that brought the Royal Newfoundland Constabulary to the scene. Following the break-in, officers stopped a vehicle on the Trans-Canada Highway and arrested two men in connection with the crime, police said. Jamie Kennedy, 40, and Cory Quilty, 41, were both charged with break and enter, theft of a motor vehicle, possession of a weapon for a dangerous purpose, unauthorized possession of a firearm, and other firearms offences. In addition Kennedy was also charged with possession of property obtained by crime and public mischief, while Quilty is charged with possession of a weapon obtained by crime. Both men appeared in provincial court Saturday. It's the fourth daring crime in a string of unusual break-ins involving different kinds of heavy equipment. Last Sunday, a front-end loader was used to cut open a TD Bank branch on Elizabeth Avenue in St. John's. 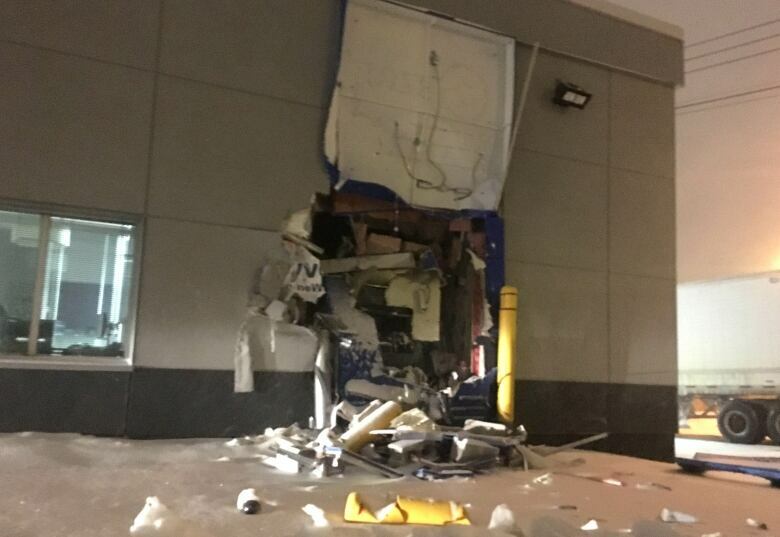 On Monday, a backhoe was used to smash through four windows at Sobeys on Kelsey Drive, where an ATM was stolen. Then on Friday, an excavator was used to rob a Scotiabank branch in the Long Pond area of Conception Bay South. The Backhoe Bandit strikes again. At least they are equal opportunity bandits,,withdrawals from 3 different banks now. Police should park heavy equipment near the banks and hop in it and wait for it all to happen then squat them to the pavement underneath the machine when it happens. This is terrible people are doing this &amp; causing damage. Make them pay.